The overall speed of the game of tennis has increased substantially over the last 25 to 30 years. This speed increase is mainly due to better equipment. First, more durable and powerful racquets made of metal materials replaced the wooden racquet which had dominated the sport for 100 years. Secondly, about 20 years ago, polyester and other synthetic type strings started to take over the sport. These strings were far more durable and inexpensive then natural gut strings, plus were much more powerful. These changes not only affected the speed of the pro game, but of the recreational game too. Because of these advances in tennis equipment extra emphasis needs to be placed on the ready position. Players need to get their racquet and body in a good position well before they want to hit the ball as there is far less time to prepare. Many recreational players do not pay much attention to the ready position or they have the wrong idea of what the ready position is. It is a relatively quick motion that only happens for a split second and is done before every swing. Even though the ready position is done before the swing and is not actually part of the swing shots are routinely missed because of improper ready position technique. The ready position is the first potential place where a mistake can adversely affect the stroke. The ready position is the time to organize the racquet, feet and body to more effectively get to and ultimately hit the tennis ball. When done correctly the ready position will quickly allow the player to get where they need to go and will put their racquet and body into an optimum position to hit the ball effectively. The bottom hand should be holding a forehand grip while in the ready position. Using a forehand grip from the baseline means the grip will only need to be changed when hitting backhands. Many players step around backhands and hit forehands whenever possible since it is the shot they feel most comfortable with. Or, in the case of advanced players, it is a weapon that can punish their opponents so they will try and hit a forehand every chance they can. Because of these factors most players will end up switching grips less than 50% of the time since they will be hitting more forehand then backhands. Some players will use a grip in between the forehand and backhand grip, often called a neutral grip. Novak Djokovic is using a neutral grip in the below image. A neutral grip is used because it takes less time to move to the proper grip position since there is less distance for the hand to travel to reach either the forehand or backhand grip. If you start from a forehand grip position the hand will need to travel a substantially greater distance to get to the backhand grip. But using a neutral grip, will increase the chance of missing the shot since the grip will need to be switched for every swing. Even the slightest mistake on switching the grip can cause the racquet head to end up in a bad position So using a neutral grip is not recommended as it requires a grip switch on every shot. Starting wth a backhand grip is also more difficult for most players as it is much harder for the hand to switch quickly from a backhand grip to a forehand grip. Although, in some cases starting with a backhand grip in the ready position is an acceptable grip position to use. If a player prefers to hit backhands and will be hitting it more than 50 percent of the time and they can easily switch from a backhand grip to a forehand grip, they should start with a backhand grip. The bottom hand should have a 30 degree bend in the wrist. 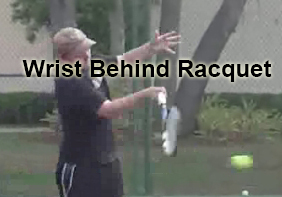 A 30 degree bend in the wrist will keep the wrist and whole arm behind the racquet during the swing leading to a contact point that is farther out in front of the body. This will give a more powerful swing as the full mass of the player’s body will be behind the ball. It also puts the wrist into a locked position which will make it less likely to move before contacting the ball. This 30 degree bend in the wrist should stay until well after contact with the ball is made. For a one-handed backhand the top hand should be kept on the throat of the racquet. Keeping the non-hitting hand on the throat of the racquet makes the racquet more stable and less likely to move in an excessive manner during the beginning of the swing. Any excessive movement of the racquet can lead to losing control during the swing. The top hand on the throat is also the proper position to have the non-hitting hand in once the backhand swing is started so it will not need to be moved to hit a backhand. For a two-handed backhand the top hand should be on the handle while on the baseline. The top hand on the handle puts the non-hitting hand into the proper hitting position so it will not need to be moved down to the handle during the swing. Starting with the top hand on the throat and moving it down to the handle when hitting a two handed backhand is not wrong (many pro’s do this), but it is a wasted movement. The only benefit of keeping the top hand on the throat is an increase in racquet stability. But, the increase in stability is not enough of a benefit compared to the drawback of having to move the hand to the handle every time a backhand is hit. The moving of the hand down to the handle takes time, sometimes there is not enough time to do this and two handed players are forced to hit one handed. This is especially true when returning serve. One way the pro’s get around this is to start with the top hand on the handle when returning serve. Many who start with their top hand on the throat of the racquet from the baseline will start with it on the handle when returning serve. There is also a potential of not getting the top hand into the proper backhand grip as it moves down onto the handle. By starting with the top hand on the handle the proper grip can be used from the start so there will be no need to adjust the top hand before hitting a backhand. When at the net both one handed and two handed players should put the left hand on the throat of the racquet if they hit one handed backhand volleys. The extra racquet stability is an advantage and since the top hand will not need to be moved to the handle this advantage should be used. For players hitting a two handed backhand volley both hands should be kept on the handle. This is done for the same reasons it is done from the baseline. At the start of the ready position it is not known which way we will need to turn to hit the ball. The racquet should be centered in the middle of the body as this will allow for an equally quick turn, with the racquet moving exactly the same distance, to either hit a forehand or a backhand. If the racquet is carried to one side it will take longer to swing the racquet on whichever side the racquet is farthest off center from. This can be an especially big problem when playing someone who hits the ball hard. The faster they hit the ball, the less time there is to react to it. The farther off center the racquet, the longer the swing will be on one side and the more time it will take to do the swing. This becomes an even bigger problem at the net when there is even less time to hit the ball. Off-centered racquets can also lead to swinging the racquet during the unit turn part of the swing instead of keeping it level. Swinging the racquet can lead to less power and a much more inconsistent swing. The racquet should be perpendicular to the body if using an eastern forehand grip. For a semi-western forehand grip the racquet will be turned slightly and not perpendicular. For a western forehand grip the racquet will be turned even further. The racquet should be held away from your body. This will put the racquet and arms in the proper position for hitting a forehand or backhand and not require them to be moved once the swing is started. The racquet should be far enough away from your body so that a soccer ball could be placed in-between the stomach and the racquet. The racquet should be low enough so that it can be seen over. This will tilt the racquet forward. Too low of a racquet makes it more likely the racquet will be swung during the unit turn which leads to excessive racquet movement and potentially gets the body out of sync with the rest of the body. This is especially true for the loop swing which requires the racquet to be up at head level during the start of the swing. Too low of a racquet can also lead to bending the back while in the ready position. This will make it harder to start running to the ball as the first thing that will need to be done to run fast is to straighten the back and body. Too high of a racquet can obstruct the view as the racquet will be in the line of sight. Too high of a racquet can make it difficult to see the opponent and what they are doing or to see the ball as it is initially hit. This is especially a problem when using a semi-western or western grip. Too high if a racquet can also put the racquet higher than needed during the swing which can make the swing too elongated causing problems on faster courts or against players who hit the ball harder. Too high of a racquet can also lead to tensing of the body as it takes muscle to raise the racquet that high. This can lead to less power and slower movement to the ball. The elbows should be up, off and away from the body. The whole body should be moving in unison and in the same direction. This helps maintain good balance throughout the swing leading to a more consistent swing. The elbows up also help put the racquet into the proper position. Elbows too close to the body can leave the racquet face too open once the swing is started and make it difficult to get the racquet vertical at ball impact without moving the wrist. The shoulders need to be in a relaxed position while the elbows are raised. This can be somewhat difficult as people will tend to tense their shoulders when raising their elbows. Relaxed shoulders will keep the upper body muscles relaxed which will give a more powerful and fluid swing. Tense shoulders will tend to make the whole upper body tense and put the upper body out of sync with the lower body. The feet should be slightly more than shoulder length apart and parallel to the net. This is the best position for the feet as it gives the proper ratio of balance and stability. Too narrow of a stance and balance will be lost making it much easier to lose control of the body and its movements. Too wide of a stance and the body will be too stable. Too much stability will make it harder to start to move towards the ball. Weight should be evenly distributed on both feet. If the weight is too much onto one foot and there is a need to run in that direction, the weight will need to be adjusted onto the other foot to push off. This will take a substantially longer amount of time then if the weight is evenly distributed on both feet. The less time you have to get to the ball, the harder it is to hit a good, consistent shot as there will be less time to set up for the shot. There should be a slight bending in the knees. This will help to quickly push off from the ground in the direction needed to go. If the legs are too straight, they will need to be bent in order to push off, which takes extra time. If the knees are bent too much the bodies center of gravity will be too low which will make the body too stable making it harder to start to run in a lateral direction. A higher center of gravity is good in tennis because most of the movement is in a lateral direction. A lower center of gravity can be better if running forward. The body should be leaning slightly forward (not leaning back on the heels). This will keep the weight forward which makes it easier to run then if the weight is back on the heels. Leaning forward, leaves the body weight in front of the center of gravity creating greater acceleration and making movements to the ball quicker and easier. All people who want to run fast and efficient will be leaning forward. The weight on the heels keeps the weight behind the bodies center of gravity which causes a natural braking action. The back should be relatively straight. This will make the bodies center of gravity higher which will increase overall running speed. It also keeps the bodies center of gravity centered which will gives good balance.